Final preparations are underway for Crosspool’s annual Selborne Road street market on Sunday 30 June. The event is your opportunity to buy local food, cakes, plants, crafts, jewellery, clothes and books and also enjoy music and dance from local schools and groups. Many of our local shops will also open up for the day. And at this year’s market, Crosspool-based entrepreneur Nick Duggan of Sandygate Park Road will be launching his own range of t-shirts featuring Sheffield street names. The collection includes Carsick Hill Road, Mushroom Lane, Button Hill, Freedom Road and Commonside. 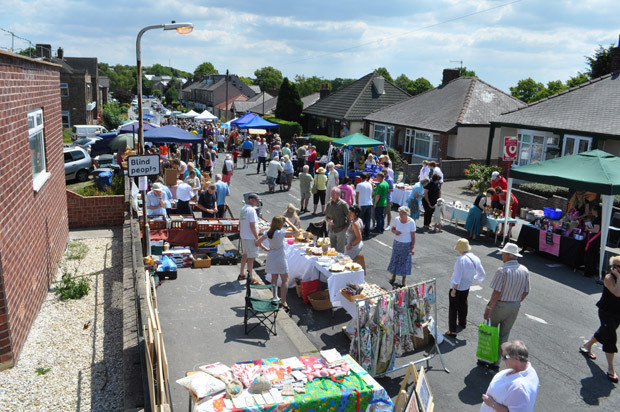 Crosspool Street market runs 12-4pm and is part of Crosspool Festival 2013. This entry was posted in crosspool, crosspool festival 2013, events, food, news, shops and tagged crafts, crosspool festival, drink, farmers market, food, gifts, selborne road, street market. Bookmark the permalink.